Hyderabad: The MMTS network in the capital city’s suburbs is acquiring a brand new look, with newly constructed stations and fresh tracks being laid by the South Central Railway to boost this local transport system that has been part of daily life for many in the city for over 15 years now. 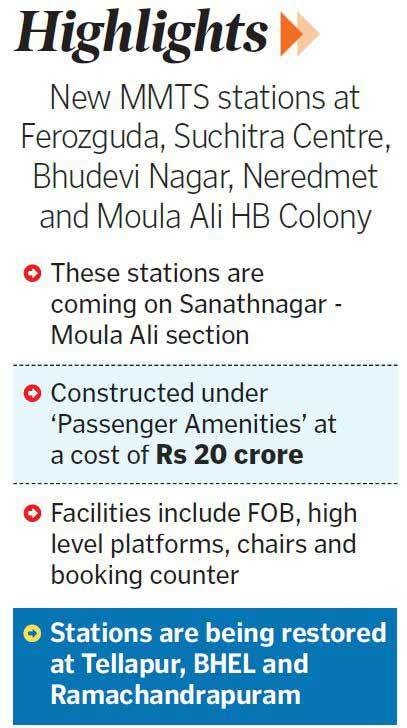 Five MMTS stations are being constructed at Ferozguda, Suchitra Centre, Bhudevi Nagar, Neredmet and Moula Ali HB Colony, on the 22 km-stretch of the Sanathnagar – Moula Ali section. The new stations are part of the on-going works on Phase- II of the MMTS project, for a distance of around 90 km across the city. According to SCR officials, work on the new stations was taken up under ‘Passenger Amenities’ at a cost of Rs 20 crore two years ago, with the budget having allocations for improvement of other MMTS stations as well. Facilities at the new stations include foot-over-bridges (FOB), toilets, high-level platforms, chairs, open waiting halls, parking facility, booking counters, Automatic Ticket Vending Machines, circulating area and indication boards. 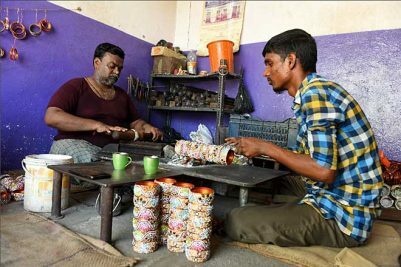 Senior officials said earlier, passengers from the Sanathnagar – Moula Ali area had to go to either Bharathnagar or Secunderabad to catch a local train. Now, with the new stretch to be opened soon, travel woes of several thousands of commuters will end. Though there is one line between Sanathnagar and Moula Ali, it was for goods trains. The dedicated line that had been laid for MMTS services would enhance suburban connectivity in a major way, they said. 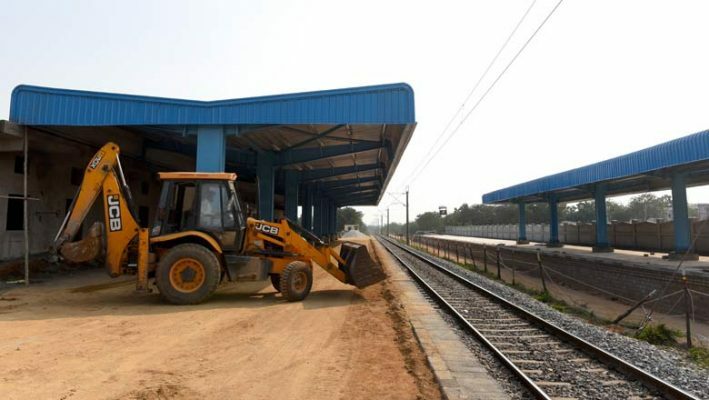 Works related to MMTS Phase- II, covering around 90 km on stretches such as Moula Ali-Ghatkesar, Falaknuma-Umdanagar Shamshabad, Secunderabad-Bolarum, Bolarum-Medchal, Sanathnagar-Moula Ali, Moula Ali-Malkajgiri-Sitaphalmandi and Tellapur-Ramachandrapuram, are nearing completion. Officials said 70 per cent of the work spread over different stretches in Tellapur -Ramchandrapuram, Moula Ali – Ghatkesar and Medchal-Bolarum have been completed while works are in progress on the Falaknuma-Umdanagar section. “Three stations will be restored on the Tellapur – Ramchandrapuram section at Tellapur, BHEL and Ramachandrapuram,” they said. The project cost is being shared by the Railways and the State government. The estimated cost is Rs 816 crore, out of which the Railways share is Rs 272 crore and State government’s share is Rs 544 crore.